I really enjoy making shoes, bones are a lot easier than hair. I did these when taking a break from my current hair project, original idea was to make them look like vintage riding boots, but they came out different than planned :D Based on Serah's shoe mesh from FF13. - For females, teen to elder. - These boots can be used in everyday, formal, athletic and career categories. - 4 recolorable areas: main body, bottom part, sole and laces. - Polygon count: 1100+ for HQ, 600+ for MQ and 300+ for LQ. - Suitable for all body shapes (morphs). Fantastic! I love the tongue and the laces! Wow these are awesome! This is the second site to have a bunch of awesome creators come together and I have to say there has been epicness of major porPortions each time! These are awesome. Again, I have converted them for TS2 because I needed the amazing in my game as well. I love all the shoes coming out with meshed laces! Thank you for these. Can I ask about the hair on the center model (pink boots)? I searched the Store but couldn't find anything similar. I don't want to point any fingers here, but you might want to give some credit to Square Enix, 'cause those are clearly the shoe meshes and textures from Serah's outfit in FF13. 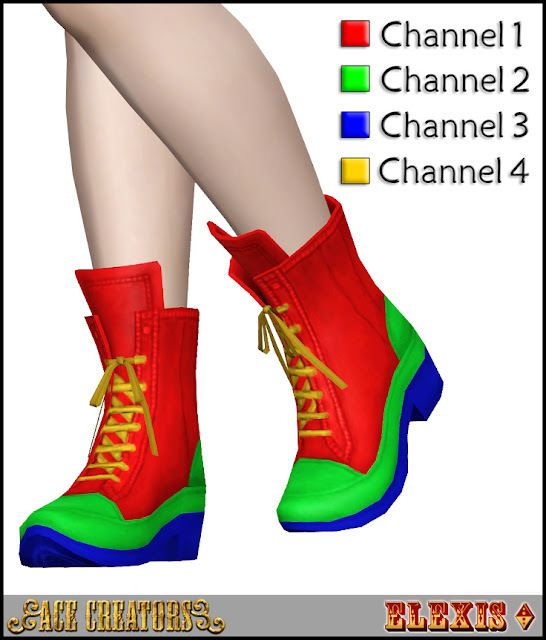 Considering I happen to possess the FF13 character models and have converted those shoes for TS3 myself, I'd be able to spot those meshes a mile away. Pyxis, these shoes were modified so much that there's barely anything left from the original one, the texture is completely mine though, redrawn from the start. I was very hesitant about putting the credits, and differently from my converted set from Alice Madness, this one had a lot more of my own work in it that it has now from the original. If you think I should put them anyway, then I need to state clearly how many changes were made and it would take a half of the page to describe. Very beautiful, I love boots, thank you. tinibutton, that hair is from Showtime Expansion Pack, other two are from The Store. Love these boots incredible. Thank You , My simmies are very pleased! Also may I inquire as to where the first models suit thing is from , very nice? And the last models clothing? Was just wondering where the first two models outfits are from? Thank you for creating and sharing these, they are fantastic! The last and first models clothes are from EP's, Not sure which ones...but not in the store, I have them in my game. I especially love the insanely cute pink boots.